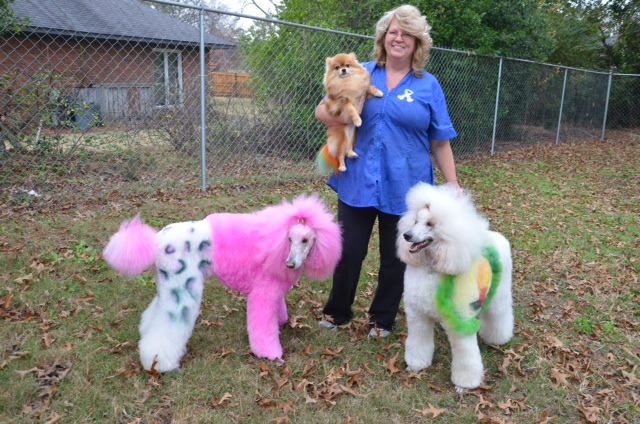 Pet groomer Dawn Omboy owns two standard poodles, one toy poodle, and one Pomeranian. If you ever wished for a poodle with a hot pink Mohawk or leopard-print nails, you’re in luck. At Klippers, a full-service spa of sorts for cats and dogs based in Columbus, Georgia, Dawn Omboy specializes in creative pet styling – dyeing fur, attaching feather extensions, and painting nails with water-based Pawdicure Polish Pens, marker-like pens that fill up with paint when shaken and pressed. Age: I’ll be 54 this year. Graduate from: I didn’t attend college. As far as grooming goes, I’m self-taught. Years in the business: I’ve known for about 39 years – since age 15 – that I wanted to be a pet groomer. Previous jobs: I did some restaurant work in my younger days. Growing up, did you tend to your family’s pets? We had a cocker spaniel and a couple of schnauzers, and I groomed them all. I wanted to do hair, and I liked animals better than people. Daily responsibilities: We come into the salon and make sure that the shampoos are fresh and the towels are fluffy and folded. Then, we receive the clients, one by one, and discuss their wishes for their pets: bathing and brushing, shaving their hair, painting their nails (sometimes with art, like little flowers or stripes), and dyeing their fur. An all-white coat underwent this foxy transformation. A few years ago, pet owners in China received a lot of press for dyeing pets to resemble other animals. Do you provide that service at Klippers? Yes. We don’t charge a lot for it, since it’s not a high-market area – a panda trim on a small dog would probably be around $75. We use an applicator brush to set in the dye, and then rinse the fur so the dye doesn’t bleed. Your craziest trim: For a Looney Tunes-themed competition, I painted Tweety Bird on one side of a dog’s fur and Bugs Bunny on the other side. I called her Looney Grooms. What’s the appeal of your work? For a special occasion, or to put a smile on their face. The color lines should be nice and sharp and conform to the dog’s body. 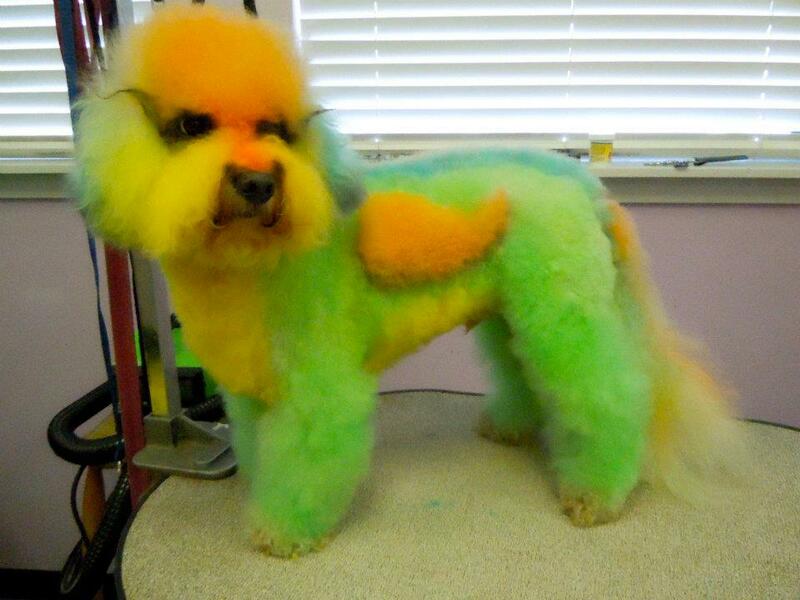 Maybe someone wants to paint their dog with school colors for a big football game, or with pastel colors for Easter. Your website also boasts feather extensions and hair tinsel. You don’t think that’s a bit excessive? I don’t, but I know that some people do. Once, I was walking with my pink poodle, and a girl hollered at me that dogs aren’t supposed to be that color. But she had purple hair! A companion dog’s job is just that: to be one’s companion. Omboy uses dyes made with beeswax and cosmetic grade pigments, which often last about six to eight weeks. Some even consider painting pets a form of animal cruelty. 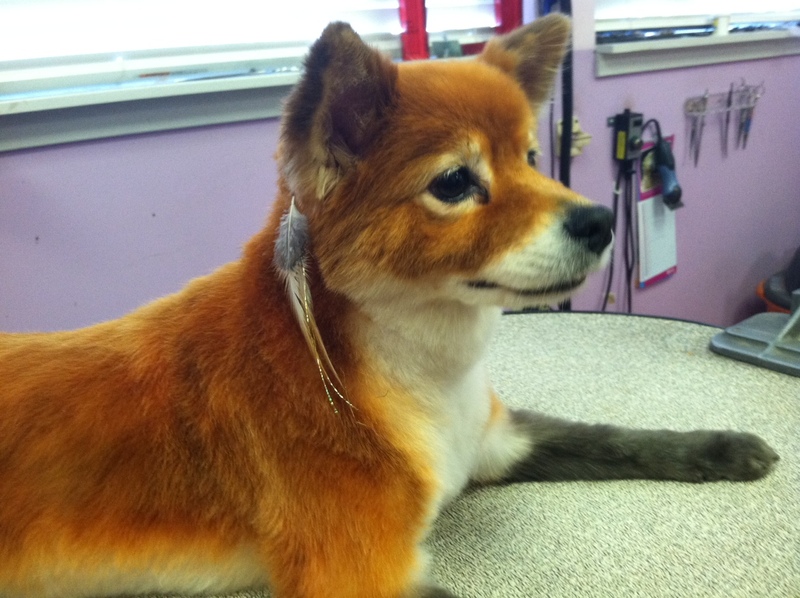 In fact, prior to July 2012, dyeing pets was illegal in Florida. I can show you pictures of things that are cruel. Neglect is cruel. Creative grooming is far from cruel. That law in Florida was meant to prevent people from dyeing Easter bunnies and chicks, but it blanketed all animals. In July 2012, they removed the law completely – after all, there are products made for animals. Did you work in Florida while the law was in effect? I competed in creative styling competitions there for a few years, until some officers from animal control came in and made a stink about it. No charges were pressed against me. Number of regular customers: More than 1,000 cats and dogs. Some are weekly, some are monthly, and some are yearly clients. Only cats and dogs? Mostly. I’ve had some freaky animals come in, like guinea pigs, ferrets, and sheep. Once, a lady brought in a miniature horse for us to shave down. How steep is the learning curve to become a pet groomer? I started off attending trade show competitions and seminars to further my education in the field. Then, I studied with the Nash Academy in Lexington, Kentucky, and now I’m a National Certified Master Groomer with the National Dog Groomers Association of America. 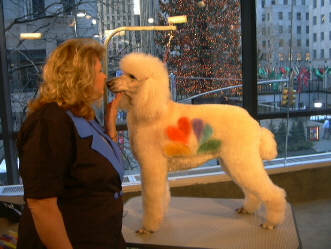 One of Dawn’s poodles sported the NBC signature peacock for an appearance on The Today Show in 2007. Best part of your job: Playing with my dogs and taking them to work. Most challenging part of your job: Watching dogs grow old and die. What would people be surprised to learn about your job? It’s very physically demanding, and you’re on your toes all the time. I probably work on about 12 to 16 dogs each day. Make sure the [animal] is comfortable with what you’re doing. This line of work is a labor of love. Learn different coat types; for example, soft, curly hair is easier to color than a coarser coat. For more No Joe Schmos accompanied by furry friends, meet the airport canine ambassador and the pet detective. All photos courtesy of Dawn Omboy and Klippers’ Facebook page. This entry was posted in Cool jobs, Crazy jobs and tagged dogs that look like pandas, panda dogs, pet care, tye dye dogs by Megan Hess. Bookmark the permalink.